Stock photo of the Stroll of the Rose-bays (Paseo de las Adelfas), at the Generalife next to the Alhambra (La Alhambra) - designated a UNESCO World Heritage Site, City of Granada, Province of Granada, Andalusia (Andalucia), Spain, Europe. Stroll of the Rose-bays is a covered walkway next to the Alhambra in the City of Granada. 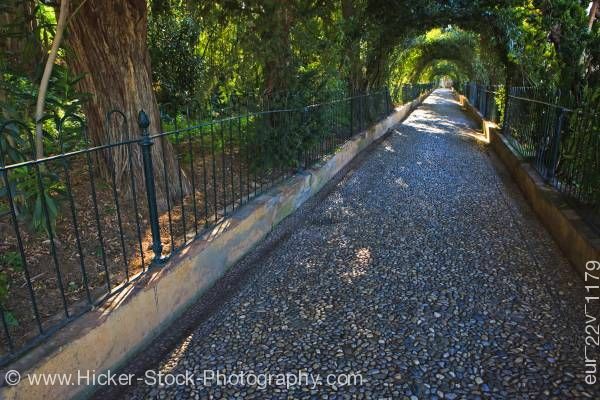 This stock photo shows the Stroll of the Rose-bays (Paseo de las Adelfas), at the Generalife next to the Alhambra (La Alhambra) - designated a UNESCO World Heritage Site, City of Granada, Province of Granada, Andalusia, Spain, Europe. A beautifully shaded stone path leads through the vine covered archways. The walkway is surrounded by a forest of lush green foliage and thick tree trunks. The sun peaks through along the shaded walk way revealing patches of sunlight on the stone path. Black wrought iron fence sits on both sides of the stone pathway along the forest. The tunneled walkway view seems to continue endlessly into the background. Stroll of the Rose-bays (Paseo de las Adelfas), at the Generalife next to the Alhambra (La Alhambra) - designated a UNESCO World Heritage Site, City of Granada, Province of Granada, Andalusia (Andalucia), Spain, Europe.